Apple closed its high-profile, announcement-packed media event with the unveiling of the one product that everyone was expecting, new iPhones. As a “tick” in Apple’s yearly release cadence, the iPhone 6s and iPhone 6s Plus focus (mostly) on internal upgrades rather an aesthetic redesign. Like previous “s” releases, the iPhone 6s and 6s Plus are defined by a single feature (the iPhone 4s introduced Siri and the iPhone 5s brought Touch ID). This time around, that new feature is 3D Touch which is essentially the evolution of Force Touch from the Apple Watch. 3D Touch is perhaps best described as right-click for your iPhone. A light press – what Apple calls “peek” – allows you to preview an e-mail, look at your calendar, view a web link, bring up a list of app options and more without leaving what you’re currently doing. Pressing harder, or “popping,” allows you to take action on apps without having to open them. The new iPhones also feature an upgraded 12-megapixel iSight camera module that offers 50 percent more pixels compared to current models. Apple said it had to employ some creative technology like deep trench isolation to ensure image quality wouldn’t be degraded with the addition of more pixels. Also new this year is 4K video, a feature that’s been available on competing devices for quite a while now. Around front, meanwhile, is a new 5-megapixel Face Time camera. Instead of using a traditional flash like on the rear, the new iPhones use the main display as a flash when snapping selfies. Another new feature Apple touched on is called Live Photos. When enabled, the phone captures 1.5 seconds of video before and after an image is snapped. This allows you to go back and view the moments before and after making a memory. Live Photos aren’t just GIFs as they can have sound and they’re not really videos either (except they are). 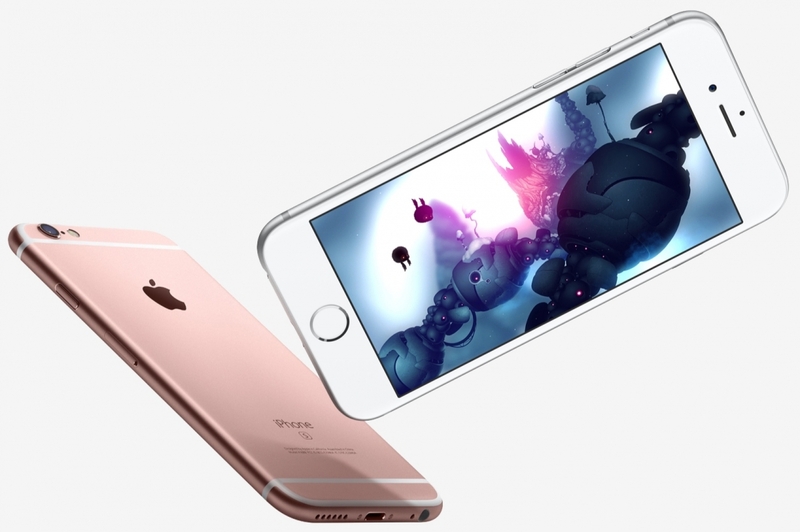 Powering the iPhone 6s and 6s Plus is a new processor, the A9. According to Apple, this third generation 64-bit chip is up to 70 percent faster than its A8 at CPU-intensive tasks and offers up to 90 percent faster GPU performance. What’s more, the M9 motion co-processor has been embedded directly in the A9 chip which allows it to remain on at all times. Speaking of always on, Apple’s voice assistant Siri will actively listen for commands just as Google Now does on Android handsets. Elsewhere, Apple has improved its Touch ID sensor which is now said to be twice as fast as before. Also getting a speed boost is wireless connectivity. The new iPhones include LTE Advanced technology with 23 bands and Wi-Fi that’s twice as fast. Bendgate shouldn’t be as much of a concern as Apple has moved to stronger 7000 series aluminum for the chassis and is using a new dual ion exchange process to harder the display. Sorry, no sapphire this year, either. The iPhone 6s and iPhone 6s Plus will be available to pre-order starting September 12 priced identically to last year’s flagships with the same storage options. There’s also a new financing option from Apple that allows you to upgrade to a new iPhone each year, much like the leasing programs offered by most wireless providers. It also includes AppleCare+, Apple's in-house insurance / extended warranty program. The new phones will be available in the familiar space grey, silver, gold and a new color, rose gold and will arrive on September 25. iOS 9, which will come on all new iPhones, will be available for all starting September 16.